The sound of moving water helps to add a tranquil feel to a garden, patio or balcony. 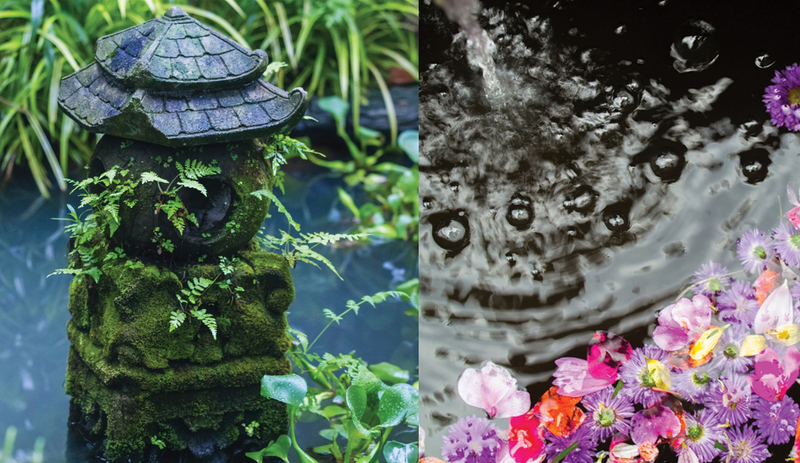 Create a gentle trickle or a stronger splash with the use of a simple pond pump and a container of water. Use these tips to help you design and plan your water feature. Above: Make a big impact in a medium to large sized garden with a waterfall or set of water chutes. Plan a feature that fits the scale of your space. Even a balcony can benefit from a small water feature, making the space more pleasant by helping to drown out traffic and other urban sounds. Take an attractive planter and use this as your reservoir. Use small lengths of bamboo to form an upright and a water spout, such as the bamboo lengths from our Starter Craft Pack. Add rocks, pebbles and small water plants to help keep the water clear. Whatever space you have outside, the water feature must be big enough not to be swamped by surrounding plants and hard-landscaping. Make sure you choose a pump with enough power to enable a good flow of water and this will help you help you achieve a significant focal point. Skimping on this is not advised! Above left: A traditional Japanese statue set in a lush pond would work well alongside our Yellow Moso Bamboo. Above right: A bamboo spout trickles water into a round basin. This is personal preference. If you already have a contemporary feel to your patio or garden, then you may want to make a feature of the water reservoir by selecting a large metal trough or oblong container in a solid, bright colour. You can then use several bamboo “gutters” or chutes lined up in a row, which will spill water into the pool below. Darker bamboo, such as Javan Black, would work well here. 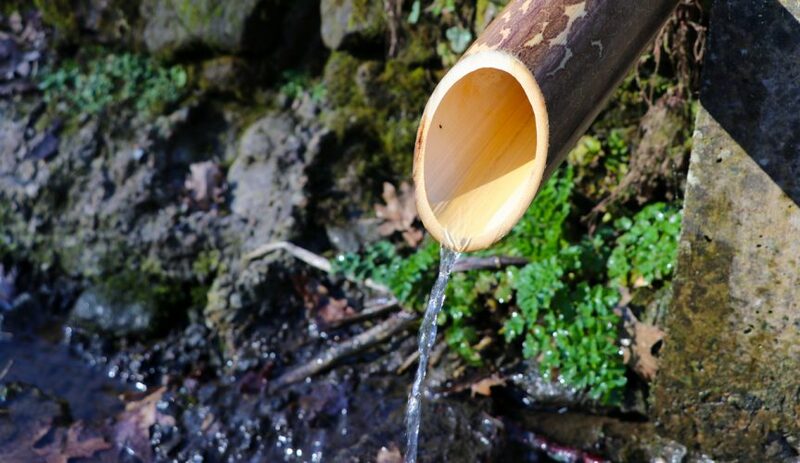 If you have a more traditional garden, then Yellow Moso Bamboo poles provide a variety of diameters that enable you to make different sized water features. 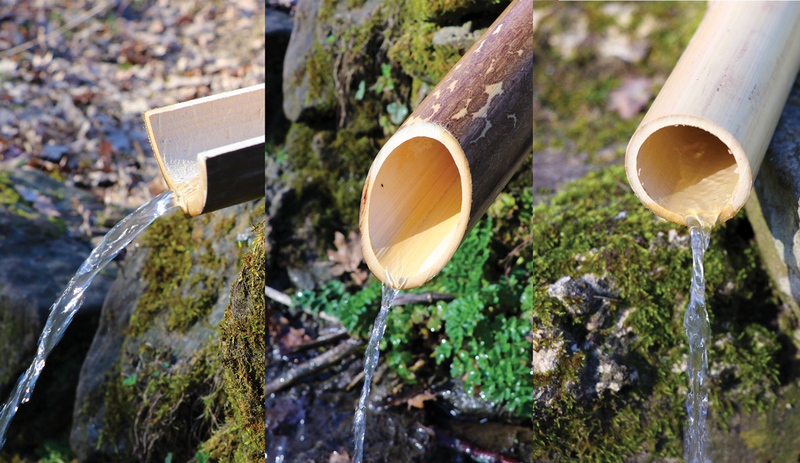 For example: a 90-100mm diameter pole would form a dramatic water spout over fish pond; open chutes or “gutters” from 70/80mm diameter poles could form a cascading waterfall through a rockery and for a traditional Japanese garden, the ‘Shishi Odoshi’ or Deer Scarer, provides an authentic element. Left: Javan Black Bamboo cut in half to form a “gutter” or rill. Centre: Speckled Bamboo cut at an angle to form an attractive spout. Right: Moso Bamboo cut to form a straight pipe. How the bamboo is cut and assembled will depend on the effect you are trying to achieve, as well as the colour and diameter. We cut the bamboo poles shown above in three different ways to illustrate this. They can easily be cut by hand using a fine tooth wood saw. Use wire wool and/or some sandpaper to remove splinters and for a good finish. Prior to installation we recommend soaking the poles in clear wood preservative to help prevent rot and mould build up. Keep this topped up once a year by painting on a clear varnish such as Shellac or yacht varnish or another few coats of wood preservative. 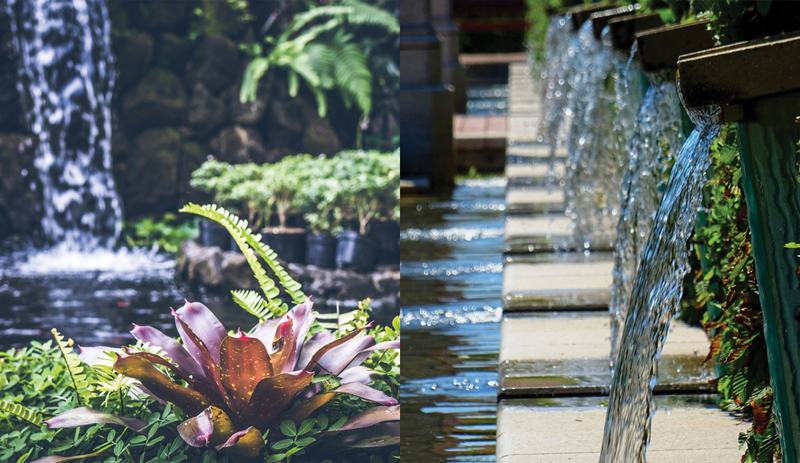 Position your water feature somewhere which receives sunlight for at least 4-6 hours per day – too much sun or shade will encourage the build up of algae and mould. You can always add a mild chlorine or bromine solution to the water, however if you have pets this may not be appropriate. Bamboo is a versatile material for creating a garden that celebrates nature. Biophilia acknowledges our connection with nature. Include bamboo in your garden you can begin to feel the benefits of Biophilic design!